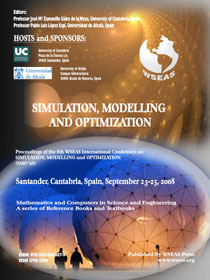 A great number of Researchers from different but related areas such as energy and power engineering, signal processing, Internet, e-learning or vídeo technologies participated in this multiconference that was held at the School of Industrial Engineering and Telecommunications at the University of Cantabria. 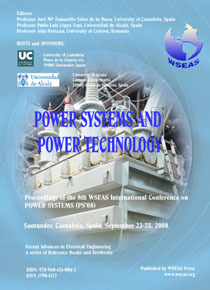 Five conferences shaped the agenda of this forum promoted by the organization of WSEAS, two universities. 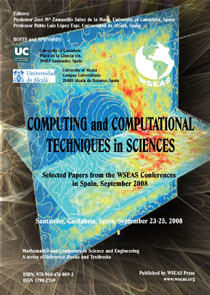 The Conferences attracted the interest of more than 400 scientists and engineers from 36 countries around the world. The opening ceremony of the congress was held in September 23 at the Faculty of Sciences. The professor at the UC Jose Maria Zamanillo, organizer of the event as a member of the Group of Radiofrequency and Microwave Engineering Department of Communications, opened the session and presented to the audience: the Vice President of Research and Knowledge Transfer, Prof. Jose Carlos Gomez Sal . The first deputy mayor of the Municipality of Santander, Samuel Ruiz, the deputy director of the ETSIIT, Francisco Javier Azcondo, responsible for the WSEAS Prof. in the Hellenic Army Academy, Nikos Bardis and University Professor Boksburg Pablo Luis Lopez was the Chairmen of the symposiums . Prof. José María Zamanillo explained that the WSEAS events during these three days would address recent developments, fresh methodologies and state-of-the-art applications in real life. Both theoretical aspects and industry applications were presented thanks to the participation of experts from universities and companies from all the world. According to what Francisco Javier Azcondo said later, "The WSEAS Multiconference is of vital importance because it encourages synergies and cooperation, since in engineering, even to develop a single project, the presence and collaboration different technologies is necessary. The Vice President welcomed the congress on behalf of the rector and highlighted the fact that "if such events are held here is because there are groups of Research & Development working on a scientific level that it fosters." Jose Carlos Gomez Sal recalled that the University of Cantabria is one of the most important Spanish universities regarding development and scientific research, especially in comparison to its size. For his part, Samuel Ruiz said that "events like this make our city to become a world reference in the field of science and knowledge, and contribute to the enhancement of the idea that Santander is now more than ever a great university town." The councilman noted that the value in science contribute to the aspiration of Santander to become European Capital of Culture. "The scientific culture is culture," added the vice president. Finally, Prof. Bardis transmitted the common hope that "the WSEAS will give us again the approval to organize the conference in this place for every two years." 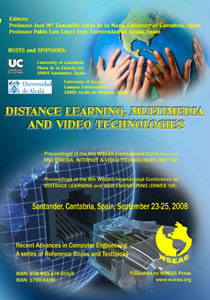 The intent of the organizers of the event -- the Universities of Cantabria and Alcala de Henares -- is that this multiconference will be held on a biannual in Spain, where he has been this year for first time, and very probably establish in Santander a new WSEAS local chapter! After the opening ceremony, the partipants of the conference went to the School of Industrial Engineering and Telecommunications, which hosted the various scientific sessions. 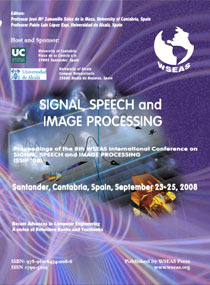 The five conferences were "Power Systems" (PS'08), "Simulation, modeling and optimization" (SMO'08), which includes a special session on circuits and systems at high frequency, "Signal, speech and image processing" (SSIP '08), "Multimedia, Internet & Video Technologies (MIV'08) and" Distance learning & web engineering "(DIWEB'08). Plaza de la Ciencia s/n. Image Denoising: From Multiresolution frameworks to Variational frameworks. by Prof. Andreja Istenič Starčič, University of Ljubljana, SLOVENIA. Editors: José Mª Zamanillo Sáinz de la Maza, Pablo Luis López Espí. Editors: José Mª Zamanillo Sáinz de la Maza, Pablo Luis López Espí, Aida Bulucea.